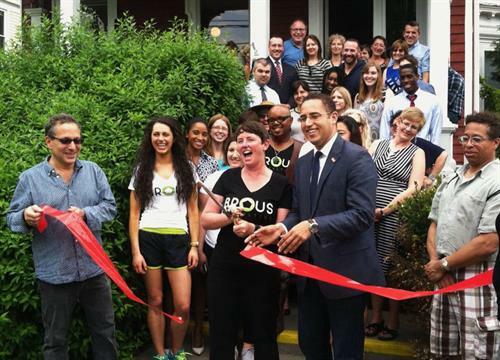 Brous Consulting, LLC, has formally opened its doors at 309 North Aurora Street, in downtown Ithaca, New York. Brous Consulting is a new Ithaca-based marketing, events, and public relations firm that focuses on providing affordable solutions for development, small business, and non-profit organizations. Brous Consulting is a 100% woman owned business and will be filing with New York State as such. The company is committed to supporting the community in which we live, and the broader global community. Through volunteering, donating to various causes, and the student internship program, the company values giving back and prioritizes this in its everyday actions. In addition to providing ample space for meetings, the 309 North Aurora Street location will allow for workshops on topics including social media, small business marketing, fundraising event design, and photo and video editing, thereby empowering clients to take control of their own marketing identity. Located in the center of the 300 block of North Aurora St. One-way street. Take Buffalo St to Aurora St. Metered street parking available for guests, or parking garage on Seneca St two blocks away.